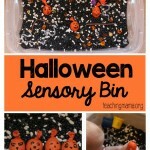 I have a fun Halloween sensory bottle to share with you today! 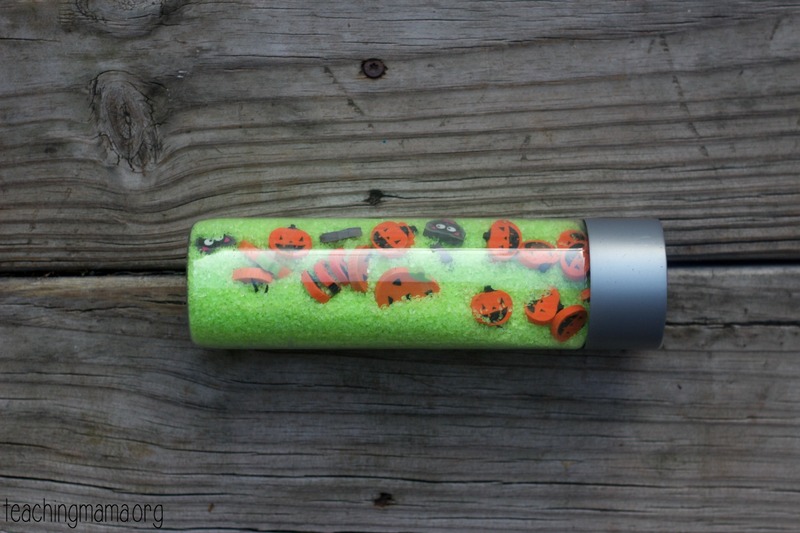 This glow-in-the-dark bottle was a huge with my toddler and a fun decoration for Halloween! 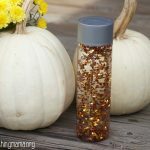 I was inspired to make this bottle after finding some glow-in-the-dark decorative fillers at Michaels. 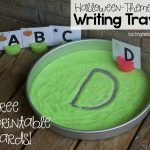 I used it with our writing tray, but it also makes a great filler for a sensory bottle! 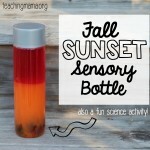 If you’re new to sensory bottles, you may be wondering why I would make this. 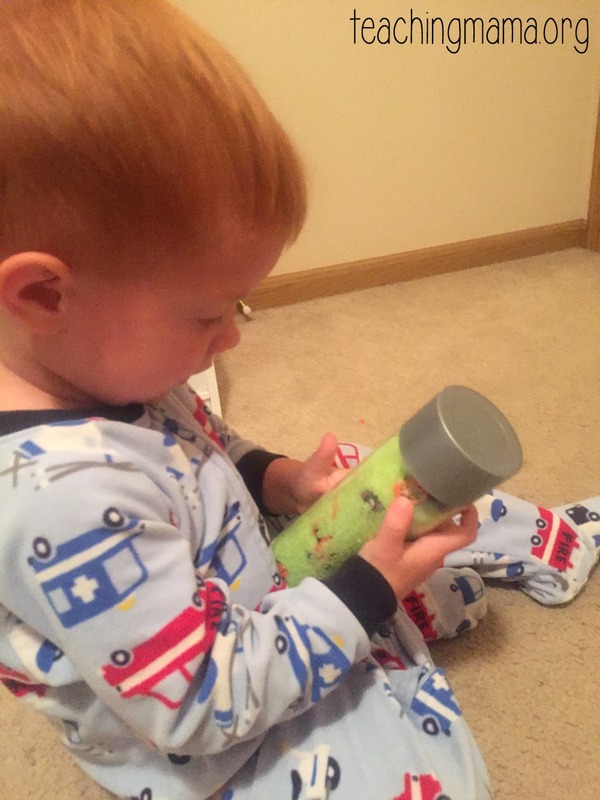 A sensory bottle is a tool for a child to engage the senses. In this bottle, the child uses sight and hearing while playing with it. 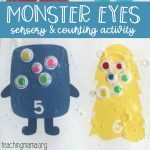 Sensory play is very important for little learners! 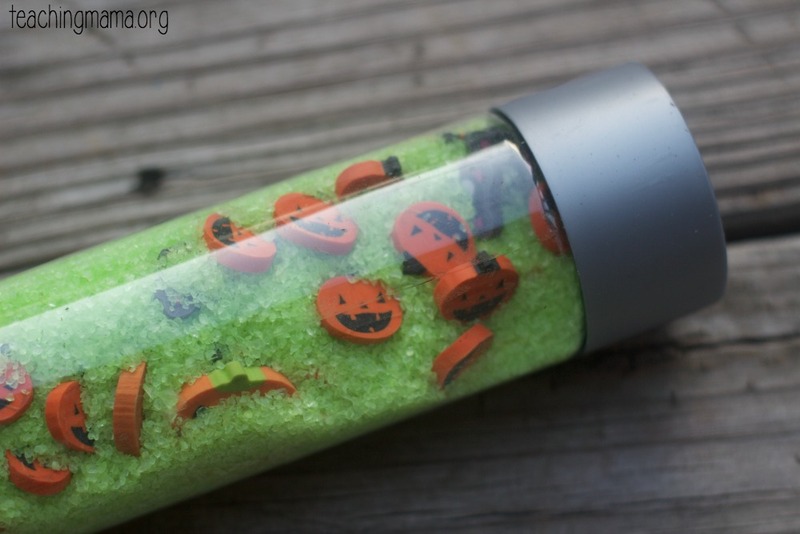 I poured some sand into the bottle and the added some Halloween erasers and spiders. I kept doing that until the bottle was nearly full. I left some space at the top so the sand could to shake around the bottle more easily. I love how it turned out! 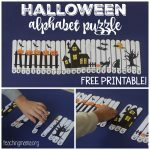 It’s simple, but very fun for my toddler. Lincoln really loved shaking this bottle. I was surprised at how much he loved it. He would shake it and find different objects in the bottle. He loved to look for the spiders! In fact, he loved it so much he slept with it!! 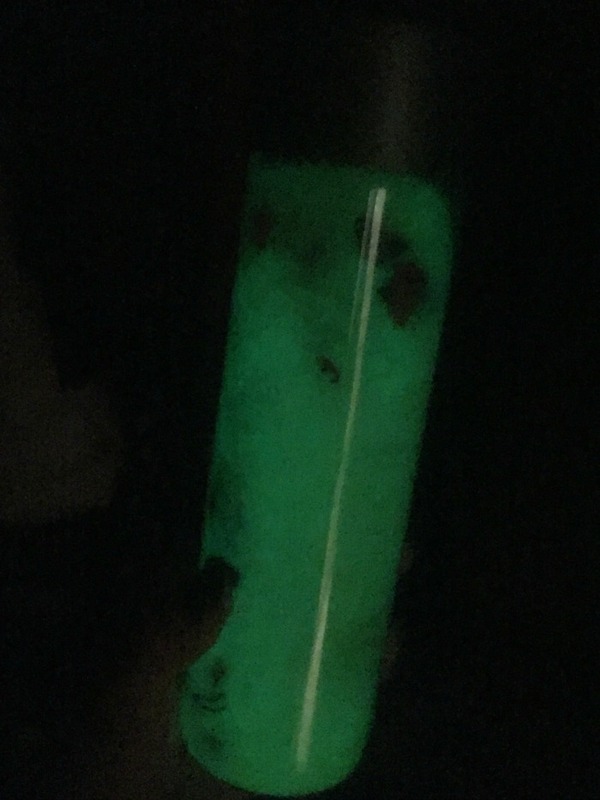 I think Lincoln loved it because this bottle glows in the dark! It does need to be in sunlight for a bit before it glows, but it really does look neat in the dark! This picture doesn’t do it justice. I wish I could find the link online for the glow sand, but I couldn’t! 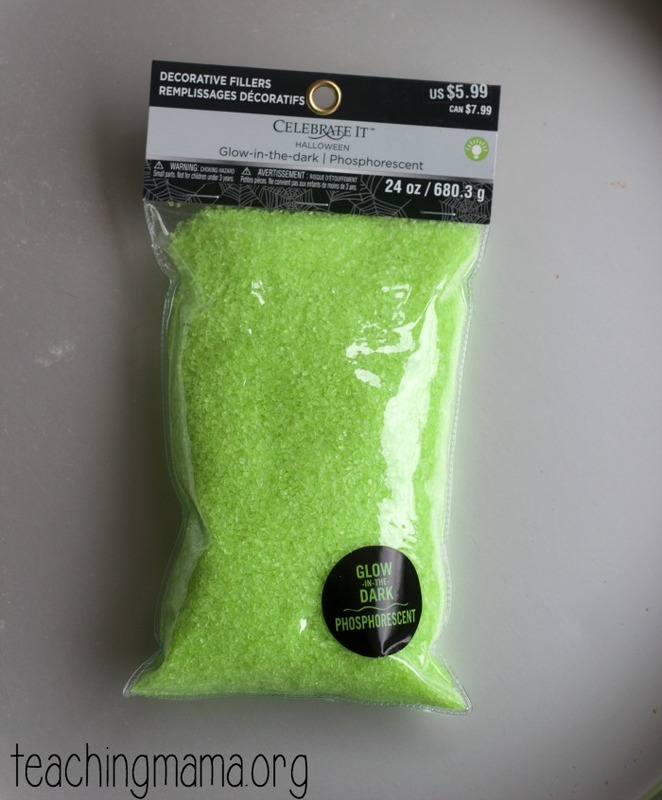 I did find some alternate fillers on Amazon that would work. You can also check out Michaels store to see if yours carries this material. I think this bottle is so fun! 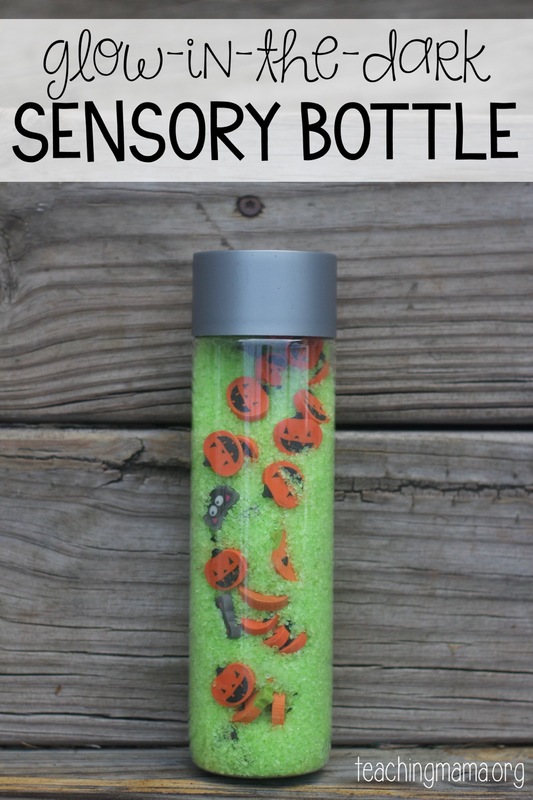 You can check out all our other sensory bottles here.